The T+PRO-1AC Kit combines two troubleshooting tools, in one convenient combo pack. The T+PRO Electrical Tester has all of the advantages of a traditional solenoid tester, with added functionality, but none of the typical drawbacks. 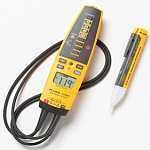 With voltage measurement, continuity, built-in flashlight, GFCI trip capability, and the legendary ruggedness and reliability of Fluke, the tester is an excellent choice for most residential, commercial, and industrial applications. The 1AC-II is the pocket-sized voltage detector that can quickly test for energized circuits - a must have for any electrician.